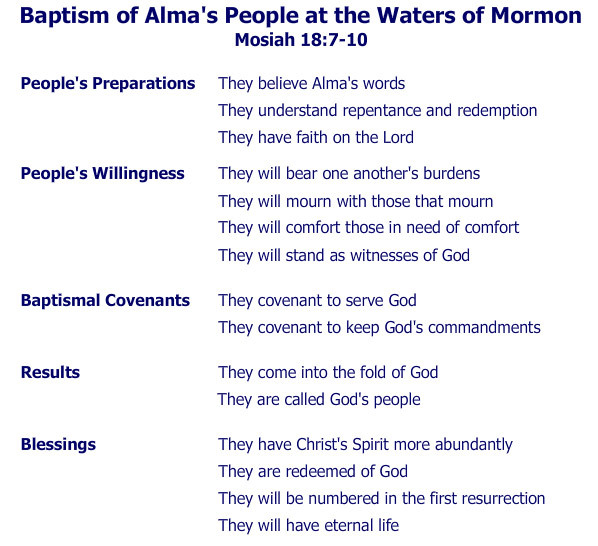 Alma, while in hiding at the Waters of Mormon, baptized about two hundred people and formed there the Church of Christ. Before the baptisms, Alma rehearsed to them their preparations and desires to be baptized, their willingness to serve and take upon themselves baptismal covenants, and the blessings promised to them if they remained faithful. This is one of the clearest statements in all of scripture about the covenants made at baptism. The elements of this baptismal speech are listed in this chart.